(AP) GAZA CITY, Gaza Strip - A shadowy group claiming ties to al Qaeda said Tuesday that it carried out a deadly cross-border attack in Israel, the strongest evidence to date to back Israeli claims that the global terror network is operating on its doorstep. While the claim of responsibility, made in a video obtained by The Associated Press in the Gaza Strip, could not be independently verified, it was accompanied by a separate statement with additional details on the attack posted on a website affiliated with al Qaeda. Israel blames Hamas for all violence from Gaza. Following Monday's attack, Israel carried out a series of airstrikes on militant targets in Gaza, drawing retaliatory rocket fire. Late Tuesday, a rocket hit a house in an Israeli village near Gaza, police spokesman Micky Rosenfeld said. Rescue services said three people were hurt. 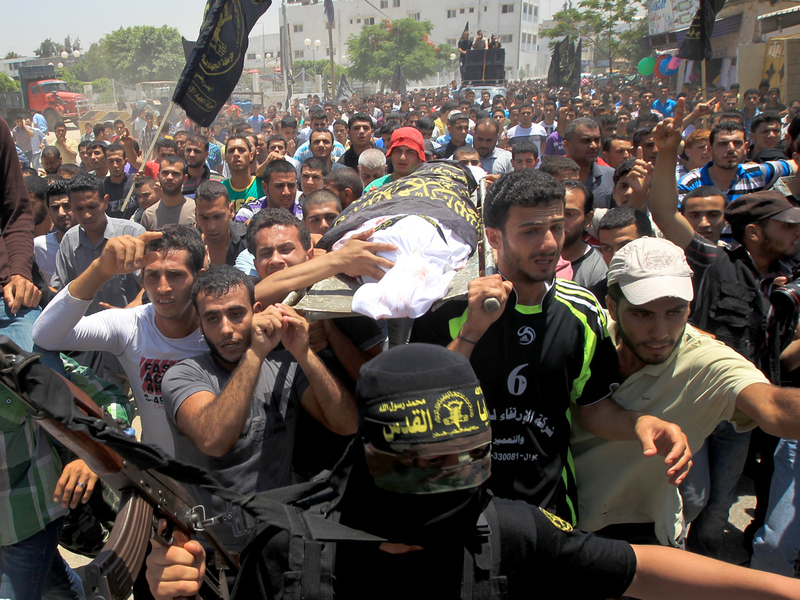 Three Palestinians were killed in violence Tuesday. An Islamic Jihad militant told The Associated Press late Tuesday night that a cease-fire with Israel, mediated by Egypt, was in effect. He spoke on condition of anonymity because he was not authorized to talk to reporters. Israel had no immediate comment. In Monday's attack, two gunmen infiltrated Israel from Egypt's Sinai desert, killing a civilian worker who was part of a team building a border fence to prevent such attacks. The two gunmen were later killed by Israeli forces. The short video said the attack was carried out by the Mujahedeen Shura Council of Jerusalem, a murky group that was formed in April. It identifies two men, one Egyptian and one Saudi, as the perpetrators of Monday's attack. "Soon we will carry out a double suicide mission against the enemy troops on the Egyptian border with occupy Palestine today, Monday, June 18," said the Saudi man. Later Tuesday, the group issued a statement on an al Qaeda-linked website saying the men targeted an Israeli patrol with a bomb, anti-tank rockets and gunfire. It said the attack was dedicated to "Sheik Mujhahid Osama bin Laden," the al Qaeda founder who was assassinated by U.S. troops last year. The Israeli military declined comment on the latest claims. Military officials have been warning for more than a year that al Qaeda is operating in the area. Israeli officials believe the group has taken advantage of the power vacuum in the Sinai since the ouster of longtime Egyptian President Hosni Mubarak last year. On Tuesday Israel's military chief, Lt. Gen. Benny Gantz, toured the area of the infiltration and said his forces are dealing with the situation. "The more significant issue is what is happening inside Sinai, the dispatch areas, the terror bases that are expanding and growing there. Egypt must exercise its sovereignty in Sinai," he said. Israeli officials also believe al Qaeda and other "global jihad" elements have infiltrated the Hamas-ruled Gaza Strip, which lies between Israel and the Sinai. Hamas denies al Qaeda is operating in Gaza. The two militant groups have far different ideologies. Hamas says its struggle is focused solely against Israel, while al Qaeda claims to be fighting a holy war against the West. Two Palestinian men in Gaza were killed early Tuesday in an airstrike, which Israel said was in response to rocket fire. In all, at least 45 rockets fell on southern Israel Tuesday, Rosenfeld said. Late Tuesday, Gaza health official Adham Abu Salmia said an explosion in a house killed a child and injured 3 others. Gaza officials initially blamed Israel, but residents there said apparently a rocket fired by militants at Israel fell short and hit the house. The flare-up in violence is the most serious in months, and has threatened an informal cease-fire that has largely held for the past three years. Hamas, which has mostly stayed out of violence, claimed responsibility for some of the rocket fire. In another development Tuesday, vandals torched and scrawled graffiti on a Palestinian mosque in the West Bank, Israeli security officials said. Suspicion fell on radical Jewish settlers angry over the looming demolition of an unsanctioned settler enclave. By July 1, the government has committed to destroying 30 apartments built illegally on privately owned Palestinian land. Radical settlers routinely attack Palestinian targets in retaliation for government settlement policy they oppose. The Hebrew-language graffiti spray-painted on the mosque in Kfar Jabaa read, "Ulpana War" and "Price Tag," the names of the outpost and the settler retaliation campaign. Prime Minister Benjamin Netanyahu condemned the attack and said authorities would act swiftly to bring the vandals to justice. "This is an act of intolerant and irresponsible lawbreakers," he said. Police said no suspects had been arrested. Israeli construction on lands the Palestinians claim for a future state is at the heart of the current peacemaking deadlock.